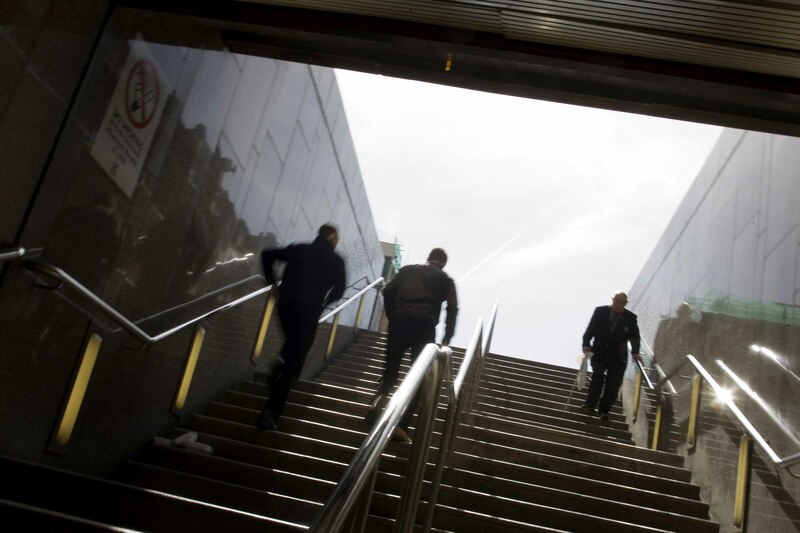 Labour Party Conference – What’s your number one priority for improving transport in cities? At the recent Labour Party Conference, we asked attendees to share with us their number one priority for improving transport in the cities. And lots of people took up the challenge, as you can see on our board below! We’re going highlight some of these here and direct you to some of the work that we’ve done in these areas. Our Policy Futures document showcases the directions for policy across transport, with more specific work highlighted below. Lots of people highlighted buses as an important area for improving transport in our cities, from synchronisation across operators, greater regulation and more frequent and reliable services to encourage people to move away from cars. Buses are vital to our city regions, with over 80% of public transport trips in metropolitan areas being made by bus and contributing £2.5bn of benefits in the metropolitan areas alone. You can find more in our Bus Policy briefing, where we argue the importance of buses to public transport. The forthcoming Bus Services Bill will devolve more powers to city regions over their bus networks, and you can find out more about the bill in our Buses Bill FAQ. And there is lots more work on the value of buses to our city regions here. Many people made suggestions around the accessibility of buses, the need for audio-visual announcements on buses and priority for wheelchair users. This is clearly important and UTG’s work has recognised the value of buses in supporting those with greater accessibility requirements. The Guide Dogs are currently leading a campaign for Talking Buses, take a look to find out more. Digital innovation is an area that UTG are increasingly looking into. Ticketing is an area that we have worked on a great deal in the past, see Smart Ticketing for more. We held an event earlier this year looking at emerging data and transport authorities, which broadens out our examinations of digital innovation, you can find more on our Smart Futures pages and a blog post about the event too. Freight transport was an area that came up and something that UTG have worked on. You can find out more on our Freight Hub and read our Vision for Urban Freight. We also held a Last Mile Challenge Conference in 2014 asking people to share innovative ideas for last mile deliveries in cities. Lots of people highlighted cycling as their number one priority for improving urban transport. Our Cycling Hub shares our work on this area, as well as providing direction to other organisations who are delivering evidence on the case for cycling investment. And, we couldn’t have a transport priorities board without someone mentioning POTHOLES! UTG has examined the economics of national and local road maintenance, and you can find out more in our Bumpy Ride report. Hopefully, for those of you who shared your transport priorities, this is a useful way of finding out more about our work on these areas. We’ll also be at the Conservative Party Conference and hopefully we can share transport priorities from there and look at some of the similarities and differences between them. 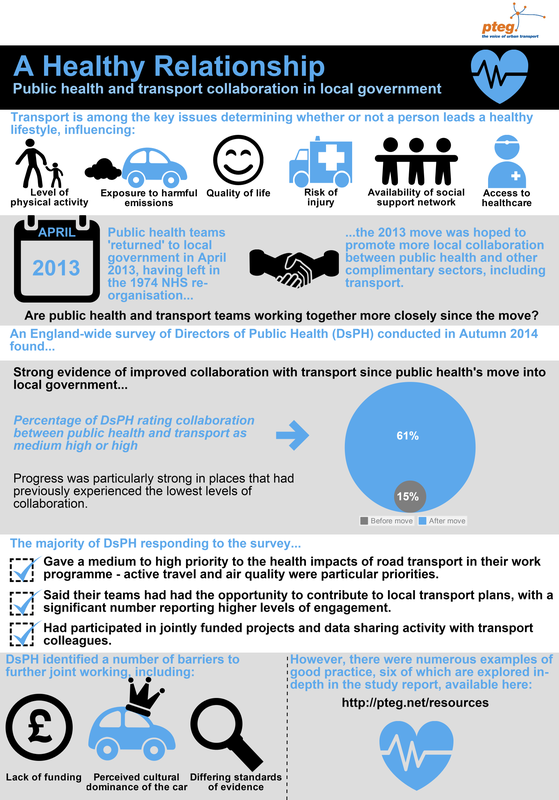 A new England-wide survey of Directors of Public Health commissioned by pteg has found strong evidence that public health and transport teams are working more closely together since public health teams moved into top-tier local authorities in April 2013. Academics want to let policy-makers know what they’ve been researching and what they’ve learnt. Policy-makers want to hear from academics, but don’t want to plough through impenetrable journal articles and research papers. Instead, they’d like the equivalent of the occasional postcard – keeping them up-to-date on what’s going on and summarising the information likely to be of most interest to them. A recent seminar hosted by UCL (in collaboration with the Department for Transport) attempted to do just that. It gathered together policy-makers and delivered a series of quick presentations (by Professor Peter Jones, Professor Roger Mackett, Dr Catherine Holloway and Dr Kayvan Karimiho) on the latest insights to have emerged from the University’s research into transport accessibility. Here are some of the key points that struck a chord with me. Transport accessibility is multi-faceted – it concerns the physical environment (can I board this bus? Can I use these stairs to reach the train platform?) but also the affordability (can I afford this journey? ); acceptability (do I want to walk down this street? ); and availability (can I get to my appointment in time?) of transport services (we explore each of these aspects in our report, ‘Transport and Social Inclusion: Have we made the connections in our cities?’). Accessibility is a continuum. You may be able to climb these stairs 95% of the time – but add tiredness, heavy shopping or an injury and they become inaccessible. Transport accessibility is an issue for all of us. Dr Catherine Holloway described accessibility as a continuum – all of us will experience inaccessibility at some point. The example of stairs was used – stairs might be accessible to you 95% of the time, but the other 5% they become inaccessible because you’re too tired to climb them, or you’re carrying something heavy. Fares are another example – if they become too expensive, some people will be priced out and that mode of transport will become inaccessible to them. For Professor Peter Jones, transport accessibility can be broken down into three levels – macro, meso and micro. Macro is the strategic level of accessibility. It looks at the big picture – the planning of transport networks that enable people to make the connections they need to get to the places they want to go at the times they want to go there. Meso concerns the accessibility of the neighbourhood or street level – for example, are there busy roads that people are reluctant to cross? Are the streets well lit at night? Finally, micro looks at the accessibility of things like vehicles and infrastructure – for example, are buses low floor? Are ticket machines user-friendly? Focusing in on the macro level, Professor Jones illustrated how timing constraints experienced by individuals have a big impact on their ability to access services using the transport network. He highlighted the packed schedules we keep – we have to fit in the many things we need to do with the hours that services operate. Think, for example, of a busy working parent. They’ll be at work most of the day and will also need to fit in taking children to and from childcare or school. This leaves very small windows to fit in things like hospital appointments, for example. The windows that are available in their schedule may not correspond to when services are open. These windows are smaller still if the person doesn’t have access to a car and is therefore further constrained by when, and where, public transport runs (and how long it takes). 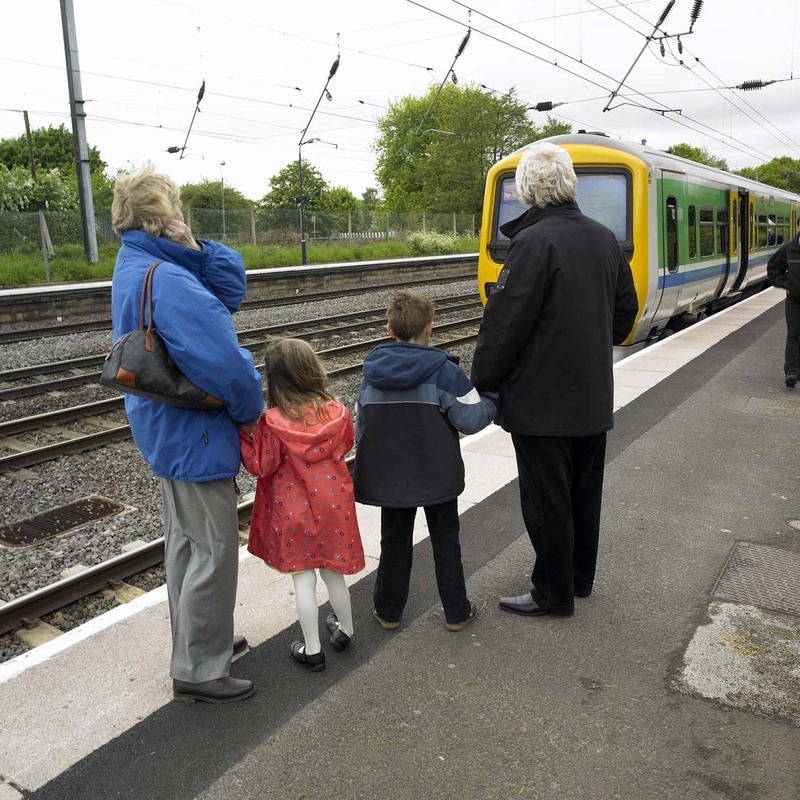 Accessibility is as much about where, when and how services are delivered as it is about providing transport connections to those services. Professor Jones reminded us that one way to overcome people’s timing constraints is to bring the services to the people (rather than the people to the services). Once upon a time we had to travel to collect water from a well, now we have it piped directly into our homes. A more up-to-date example is online grocery shopping where we can select a delivery slot that suits our schedule rather than travelling to the shop. Indeed the internet is allowing us to access a wide range of services remotely, such as attending appointments with hospital specialists remotely via local GP surgeries. 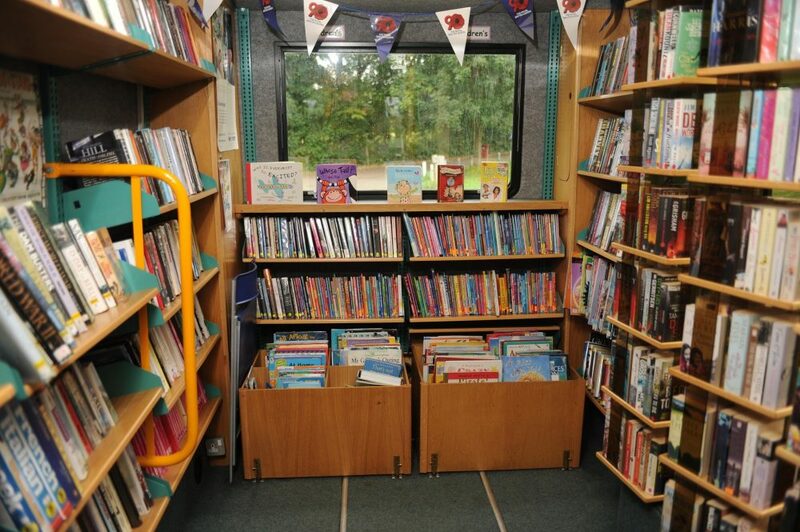 Services can also be made mobile – by no means a new idea of course – I have fond memories of the mobile library van parking at the top of my street, not to mention ‘the freezer man’ with his van full of chocolate mousse, fish fingers and other frozen delights. One group that you might expect to be less time constrained than most is older, retired people – however, as Professor Roger Mackett’s presentation showed, this group are far from idle. Older people cost the nation £136bn but, according to a report by WRVS (called ‘Gold Age Pensioners’) they contribute £176bn. This contribution comes in the form of consumer spending, unpaid childcare and adult social care and a wealth of volunteering. Professor Mackett argued that the easier we can make it for this group to travel, the more contribution they can make. The free bus pass for older people undoubtedly assists with this – offering freedom and confidence to travel further. It also, he points out, eases the transition from ‘driving’ to ‘not driving’ allowing people to take the bus for trips they no longer want to make by car (for example, they may wish to avoid night driving). The more journeys older people are able to make, the greater their potential contribution to the economy. He showed data indicating that as people age, they make more shopping and leisure trips – trips that are of great value to the economy. When asked what sort of trips they would like to make more of, older people said visits to friends and family. According to surveys, a lack of direct transport options is what limits older people the most in making these trips. What could we do to facilitate these suburb-to-suburb, rather than suburb-to-centre trips? Professor Mackett also noted that the majority of older people do not have an impairment and that those they do have are frequently ones we should easily be able to design for and accommodate. Older people may have difficulties with mobility, lifting and dexterity. How might we design ticket machines, for example, to be easy to use for people with limited dexterity? Such designs are likely to be easier for everybody. Professor Mackett’s presentation also looked at the accessibility of the street environment. 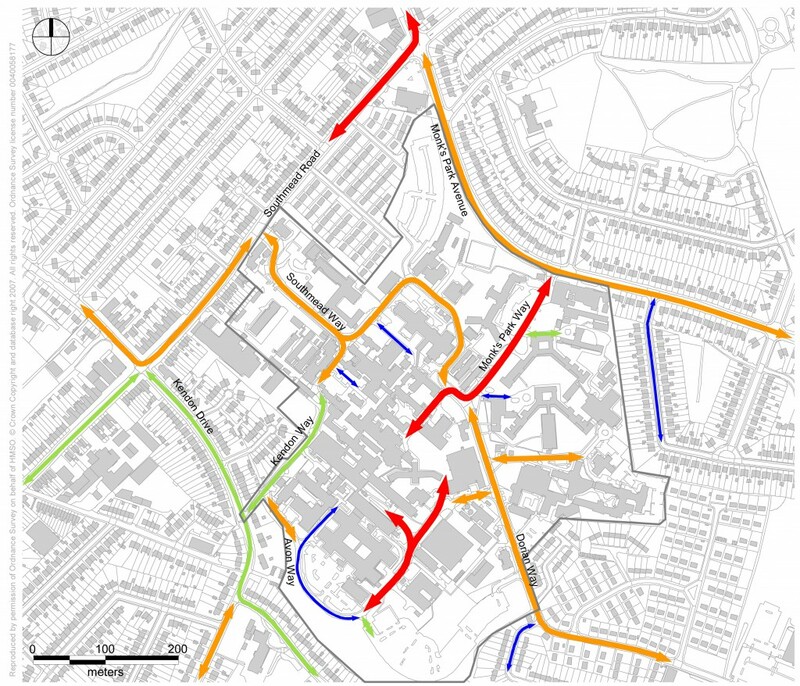 UCL conducted a study in St Albans, mapping the streets and identifying lots of small barriers that could be making a big difference to people’s mobility. This could be anything from a poorly lit street to an A-board obstructing the pavement. Professor Jones added that people are prepared to walk, on average, an extra 2.2 minutes just to avoid crossing a busy road. People are prepared to walk three times further to avoid poorly lit streets (rising to five times further among women). St Albans City and District Council took the findings of UCL’s street audit on board and used it to inform their Public Realm Delivery Strategy, which includes measures like installing benches every 100 metres to allow people rest stops along their journey. St Albans’ approach chimes with the Dr Kayvan Karimiho’s belief that city planners should not just plan for accessibility, but use accessibility to plan, designing street layouts and transport networks that correspond to the way people naturally want to move about. In his presentation, Karimiho described how, when walking or cycling, people prefer to take the smoothest, rather than the quickest route to their destination. When we look at a map, we choose a route with the most straight smooth lines, with fewer twists and turns down back streets. However, modelling of accessibility tends to be based on the shortest routes from A to B, rather than the way people actually move. Dr Karimiho’s methods and mapping reveal these real-world movements which can then inform street layouts and transport networks that maximise accessibility. UCL’s work in this area is assisted by Pamela (Pedestrian Accessibility Movement Environment Laboratory). This is UCL’s artificial street environment where researchers can test how people interact with their environment in real world situations. It can be used to model, for example, passenger boarding and alighting from public transport vehicles, shared space schemes and even the effects of mobile phone use on pedestrians. The seminar ended with a determination to organise more such information sharing events, something that, along with the recent launch of the ‘What works’ initiative by the Government, seems part of a wider trend to bridge the gap between policy-making and academic study. The ‘What works’ evidence centres for social policy will produce and disseminate research to local decision-makers, supporting them to invest in the services known to produce the best outcomes. We can therefore look forward to receiving many more postcards from what can sometimes seem a faraway place.